Well, it worked. However I decided that it wasn't right for the swap, so went on to Plan E (which was a revised Plan C). Plan E worked and is now ready to be wrapped and posted. You'll have to wait for the details of that one, I don't want to spoil the surprise. Anyway, back to Plan D. This started life as a copy of The Iliad. 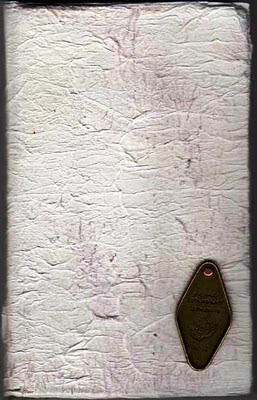 It's only small (7" x 4" and about ½" thick), and at some time in the past has been repaired by the local library and covered in clear plastic, so the first task was a coat or three of gesso. After that it was covered with kitchen roll, applied with a diluted PVA glue/white acrylic mix and allowed to dry. Once dry it was painted with a layer of white acrylic and left to dry. Then another layer of kitchen roll, layer of acrylic, and so on. The kitchen roll crinkles and warps while it's wet and gives that lovely texture you can see. Also, the PVA/acrylic mix sets really well and should be quite robust. Once the final layer was dry I added the brass plaque and left it alone (managed not to overdo it for once). The signatures were put together using various papers; registration pages, manuscript, tracing paper, etc. These were then bound together, and sewn onto a strip of fabric. The whole thing was then glued into place and the fabric edges covered with more kitchen roll/PVA mix. I'm not sure what I'll do with it, but it's small enough to carry around and work in when the muse strikes. and i can so relate to your comment about "not overdoing it". I've been there. I think that's the key to being happy with our results (as artists) - knowing when to stop. I've "overdone" it many times, but even that, is a lesson, isn't it? Thank you for sharing your process... whew... sounds complex! But i so love the end result. Beautiful work. Bravo! 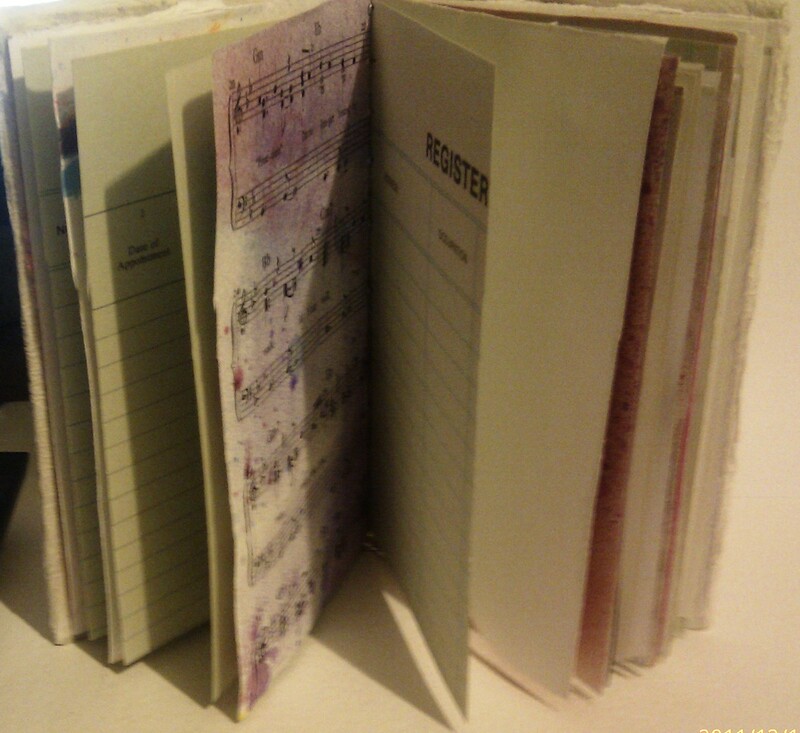 It can be a book for writing and drawing and you can jot ideas down. Carry it around at all times. When it's full of your ramblings/ musings etc, it will provide interesting reading material in the future when you've forgotten all about it. 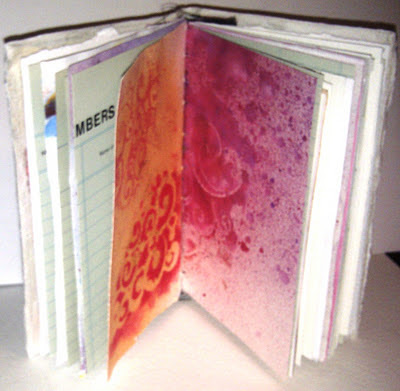 Must be the silly season for book making. That's what I was doing yesterday. I've never thought of doing a cover that way but it looks wonderful and will be very sturdy! Can't wait to try it! Thanks for sharing! I love homemade books - there is something truly magical about them.